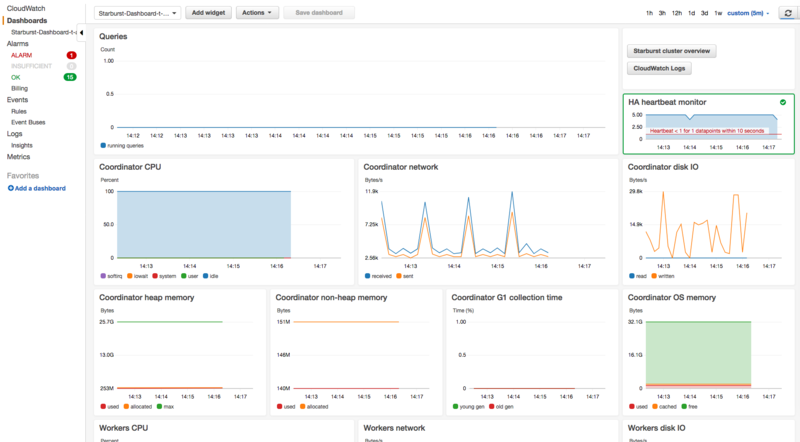 Starburst’s CloudFormation template provides optional integration with CloudWatch metrics. Metrics integration can be enabled via EnableCloudWatchMetrics template property. When enabled detailed OS and Presto metrics will be collected and uploaded to CloudWatch metrics service. Additionally, a CloudWatch Dashboard with cluster overview will be created. Metrics will be stored within Presto CloudWatch metrics namespace. Metrics collection interval is 10 seconds. Metrics are split into Node and Presto types. cpu_usage_idle, cpu_usage_iowait, cpu_usage_system, cpu_usage_softirq, cpu_usage_idle – percentage node CPU usage. Those metrics additionally contain cpu dimension which is always cpu-total. mem_used, mem_cached, mem_free – node OS memory usage. net_bytes_recv, net_bytes_sent – amount of bytes sent/read within last collection period (10 seconds). Those metrics additionally contain interface dimension which is always eth0. diskio_read_bytes, diskio_write_bytes – amount of bytes read/written within last collection period (10 seconds). Those metrics additionally contain name dimension which is always xvda1. RunningQueries – the number of currently running Presto queries. HeapMemoryUsage_used, HeapMemoryUsage_committed, HeapMemoryUsage_max – JVM heap memory usage metrics. For more information see MemoryMXBean. NonHeapMemoryUsage_used, HeapMemoryUsage_committed – JVM non-heap memory usage metrics. For more information see MemoryMXBean. gc_young_CollectionCount, gc_young_CollectionTime – counter and timer for G1 young and mixed collections (see also GarbageCollectorMXBean). gc_old_CollectionCount, gc_old_CollectionTime – counter and timer for G1 full collections (see also GarbageCollectorMXBean). Ideally, those metrics should always be 0. Apart from per node metrics, there are also aggregated metrics with data from all workers. Those metrics contain only: Category, PrestoNodeRole, PrestoStackName, Type dimensions. When metrics are enabled Starburst’s CloudFormation template will also create a cluster overview dashboard with Starburst-Dashboard-STACK_NAME name. Dashboard contains various charts that provide visualization of collected metrics for coordinator and workers, but also HA (see Presto Coordinator High Availability) alarm state and useful Presto links. Metrics and dashboard can be used to determine various Presto performance issues. As an example, Presto should never trigger full G1 garbage collection during normal operation. Therefore gc_old_CollectionCount, gc_old_CollectionTime metrics should always be 0. Metrics can also be used to investigate cluster bottlenecks. For instance, it is possible to easily verify if cluster fully utilizes network, cpu or disk capacity. AWS CloudWatch metrics, dashboard and API requests come with a fee (see Amazon CloudWatch Pricing). While the number of aggregated metrics is constant (below 30) the number of per-node metrics scales with the number of nodes. There are in total 21 metrics per node.